Pros: Terrific impressions of both John Major and Tony Blair. A polished performance throughout. Cons: Doesn’t go that extra mile, drags a little towards the end. Our Verdict: Impressively refined and interesting theatre from this amateur company. What is interesting about fringe theatre is the expectations that people come in with. Many a time an audience isn’t really expecting a whole lot from the humble companies they watch. What’s great about this play is that it starts so well that you automatically find yourself wanting more from it than you originally did coming in. Personally I thought the prologue in particular was a strong exhibition of the writers’ linguistic wit and raised the audience’s expectations for what was to follow. 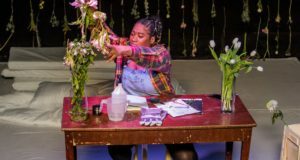 Created first for the RSC Open Stages Project, this piece of new writing has already enjoyed success at the Lion and Unicorn Theatre earlier in the year, and the success is well deserved. Inspired by all the classic language and characters of Shakespeare, the play presents a satire. It delivers so accurately on the blurb given in the programme that it almost feels like plagiarism to try and write about it in a review. Many try to fuse Shakespearean language with modern themes and plots, and the results can be quite mixed. 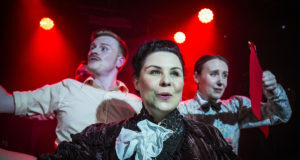 KDC Theatre has achieved a wonderfully unique blend that shows great talent and promise from their writers, who confess to being ‘amateurs’ along with the rest of the company. Using not only the language of Shakespeare, but also many of the playwright’s stylistic devices, we see events unfold through the eyes of a range of classes, from royalty to the paparazzi who photograph them. ‘Media’ is the villain here, as it preys upon scandal and fame. Instead of traditional soliloquies, the characters address the nation in speeches and interviews, reinforcing the difference between public life pretence and the real thoughts and feelings of these personalities. The pivotal storyline, following the separation of Prince Charles and Princess Diana, is well balanced within the political context at the time and the piece as a whole gives us not an accurate, but a satirical look back to the 90s, which now feel so far away in our memories. The royal cast, namely Alex Wheeler as Diana and William Baltyn as Charles, do brilliantly to capture the well-known characteristics and mannerisms of the Princess and Prince. 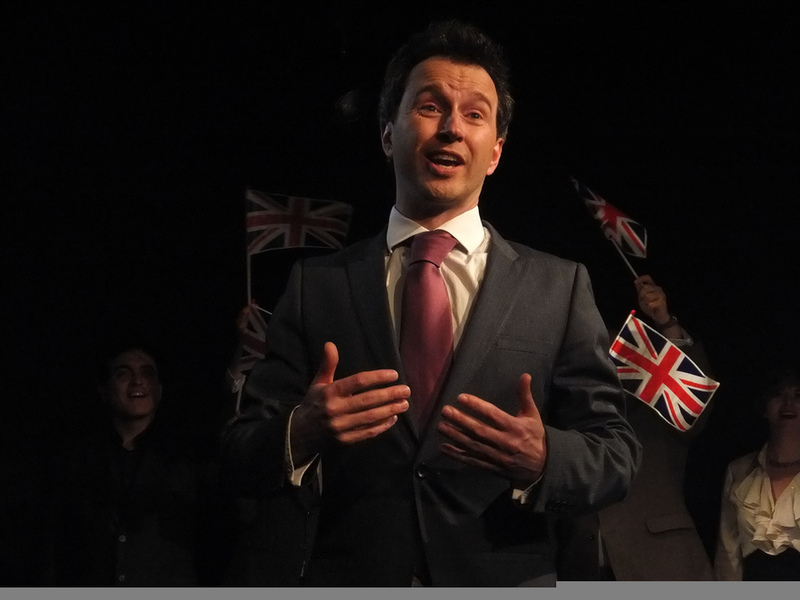 However by far the best impressionist on the stage is Stephen Russell, doubling up as both Prime Ministers. His caricature presentations of both Major and Blair are thoroughly entertaining and one of the best moments of the evening comes from his entrance as Tony Blair. The play sets out to give a Shakespearean account of the decade of change seen in the 90s in Britain, and what it produces is a brilliantly entertaining account of that time. If there are weaknesses they come few and far between; a few muddled lines here and there are hardly anything to get angry about. I did feel that the piece did not seem to take too strong a stance in any one moral direction, be it choosing between Charles and Diana or Major and Blair. No doubt this is a deliberate decision, but perhaps more could have been made of the polarity created by these divisions. As such, the play doesn’t do too much to change my perception of the issues that are raised, so in that sense it doesn’t do a lot. However it’s a confident new play and there’s no reason not to enjoy it for what it is. The War of the Waleses runs at The Pirate Castle on 14, 15, and 21 August 2012 at 8.00pm.